China is ready to mass-produce a new strike-capable unmanned aerial vehicle. According to the chief designer of the CH series, Shi Wen, the CH-5 is as good as the U.S.-made General Atomics MQ-9 Reaper. Nevertheless, there is speculation that the CH-5 has much weaker engines than either the U.S.-made Predator or Reaper resulting in more limited range and speed in comparison to U.S. models. Chinese UAV models (including the Wing Loong II) lack in detection capabilities and overall endurance when compared to Western models. The medium-altitude long-endurance (MALE) CH-5 purportedly has a wingspan of 21 meters and can carry a payload of up to 1,200 kilograms (previous reports indicated 900 kilograms)– 2.6 times more than previous combat UAVs of the CH series. Overall, the CH-5 can carry up to 16 air-to-ground weapons including Lan Jian 7 (Blue Arrow 7) laser-guided air-to-surface missiles, TG100 laser/INS/GPS-guided bombs, and AR-1/HJ-10 anti-tank missiles. The CH-5 is reportedly capable of linking up with other combat drones to conduct joint missions. “Another advantage is that the CH-5 is capable of making a joint strike together with its predecessors, the CH-3 and CH-4, because they can share the same data link and control system. Therefore, it is very easy for current users of the CH-3 and CH-4 to introduce and integrate the CH-5 into their drone network,” Shi said in November 2016. The drone’s operational range is around 250 kilometers via line-of-sight datalink and approximately 2,000 kilometers with satellite communication, according to CASC. “However, other reports indicate that the maximum range of the UAV is 6,500 kilometers and will eventually be increased to 10,000 kilometers,” as I explained elsewhere. Powered by a 330 hp heavy-fuel engine (HFE), the drone has an operating endurance of up to 60 hours and a purported service ceiling of 30,000 ft (7,000 m). The CH-5 conducted its maiden flight at an undisclosed airfield in Gansu province, China in August 2015. The CH-5’s maiden flight latest for about 20 minutes. CASC for the first time publicly displayed a prototype of the CH-5 during the 2016 China International Aviation & Aerospace Exhibition in Zhuhai. China’s new unmanned aerial combat vehicle will be fitted with a new heavy fuel engine. 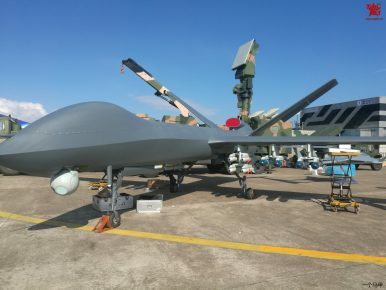 China Publicly Displays New Killer Drone for 1st TimeChina Unveils Its Largest Killer Drone To DateRevealed: Chinese Killer Drones in Iraq Is China Fueling an East Asian Arms Race?Why is China Developing a New J-11 Variant?